It’s that time of year, when the herbs seem to be growing faster than I can harvest them! That’s why I’m excited to share “4 Ways to Dehydrate Herbs” with you! You might remember my post a while back “How to Design an Herb Garden“. Well, that little garden is cranking out some serious amounts of herbs, and so I find my self using more than one method to dehydrate them. My tried and true, old-fashioned but much preferred way to dry herbs is by simply hanging them. Let nature do it’s thing and just let them dry. This method only requires a string and a place to hang it. It makes the house smell wonderful and it doesn’t take long at all. Don’t bunch them too tightly together or they may mold, just tie them loosely. Make sure air can circulate between the stems. 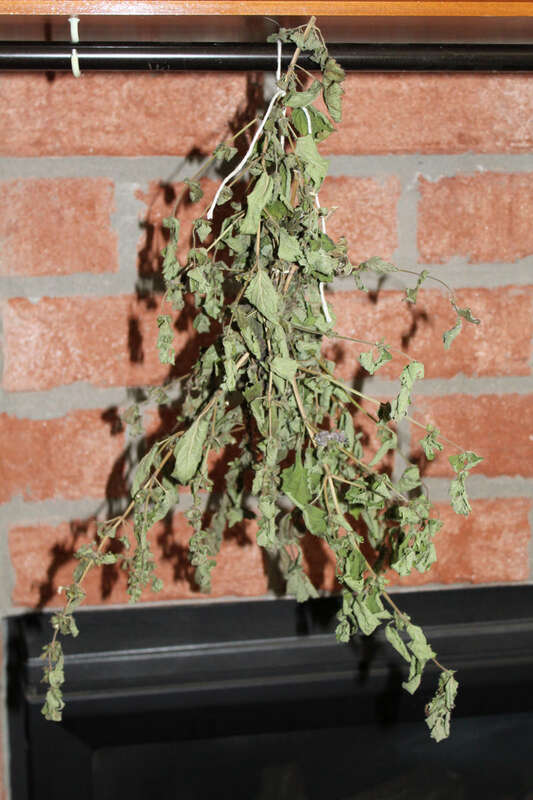 However, sometimes when you have a TON of basil or some other herb coming in, it’s just not possible to hang herbs ALL over the house. Here is where it’s a good idea to have some other options. 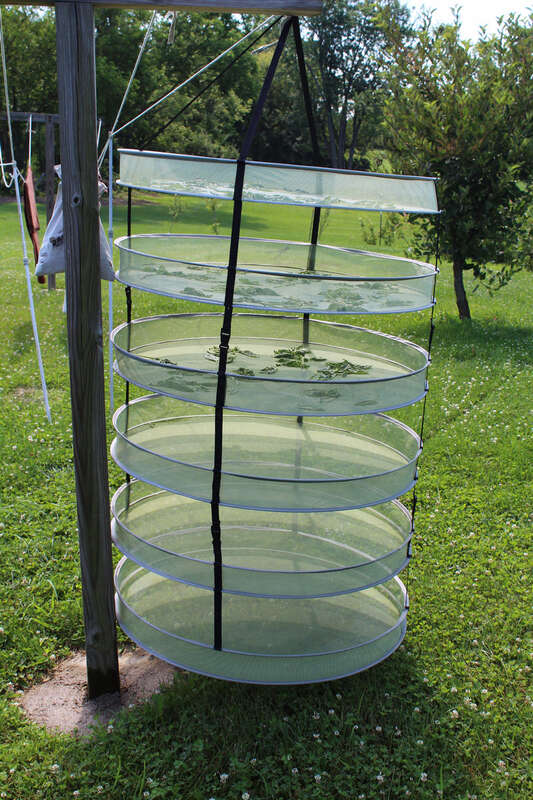 When the weather is scalding hot, it’s a great time to dry your herbs on a hanging herb dryer! Here’s mine on the clothesline! I just LOVE this thing! It uses no electricity and makes some use of days where the heat index is 100 degrees! 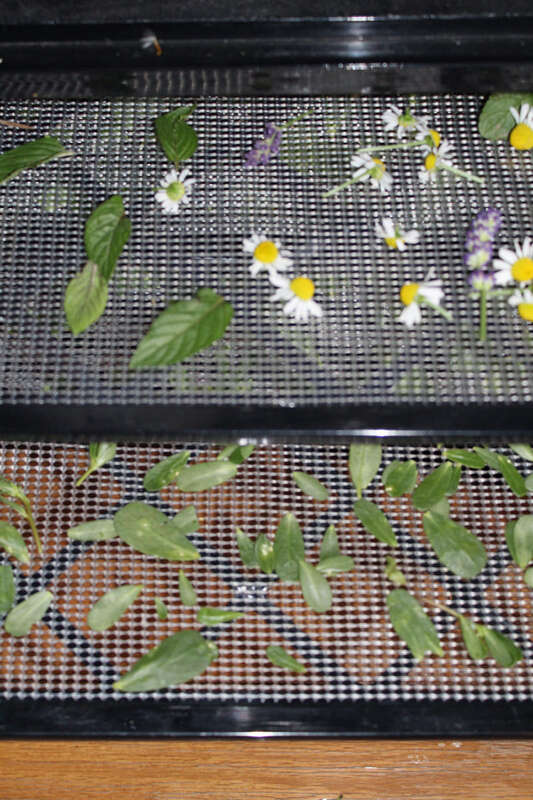 The third way to dehydrate herbs is with a quality dehydrator. I must warn you not to skimp on a cheap dehydrator if you want it to last. I fully expect my Excalibur dehydrator to last until one of my daughters inherits it! In order to buy mine, I had to save for a bit, but it was very much worth it. That way, you’re only buying it once. Simply spread your clean and dry herbs on the dehydrator’s tray and set to correct temperature (Excalibur has a little cheat sheet right on the dial!). Once the herbs are dry, let them cool. Simply strip the leaves off (or whatever part of herb is usable) and keep in an airtight jar. I not only use mine for drying herbs, but also for drying fruit and making fruit leathers! And finally, for you folks who are totally DIY, this is a very cool project! 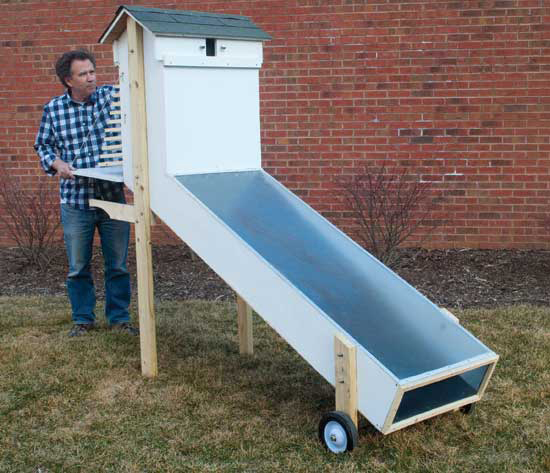 Here are the plans to build an awesome solar dehydrator from Mother Earth News! This might be a fun project to do with an older child, or something to ask your super-handy husband to build for you! 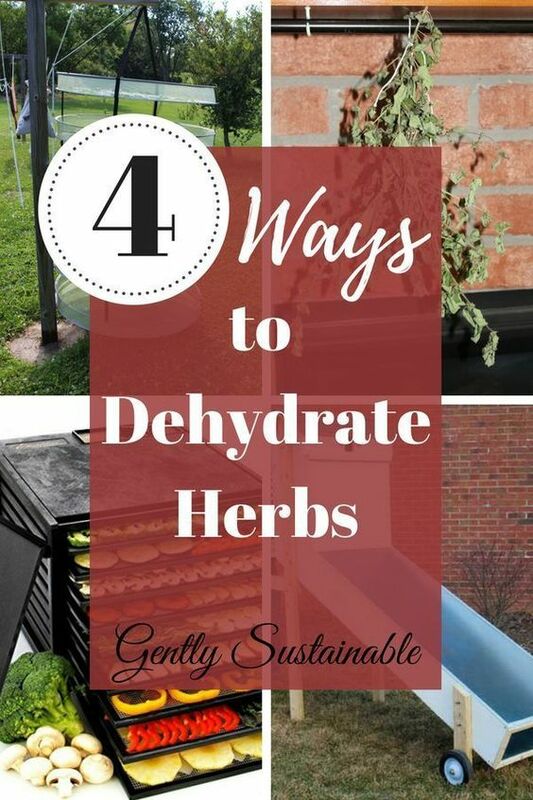 So there you have it, “4 Ways to Dehydrate Herbs”! Don’t miss out on your herb harvest, get out there and clip some today!